Yeeha! 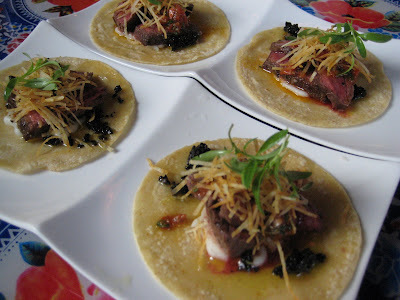 W wanted tapas for dinner and I threw out Distrito as an idea. Then my brother balked saying he didn’t want mexican food. I insisted anyway. And W agreed. I quickly made a reservation, just to be safe, and we headed out. It was super early (early bird special early) so a reservation probably wasn’t necessary. The place is huge and gawdy, something fierce. Terribly bright and colorful, but I didn’t mind. It was supposed to be overly stylized. 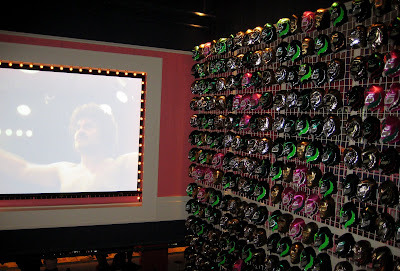 I personally loved the wall of lucho libre masks. 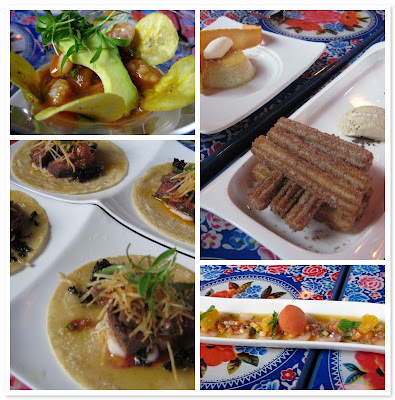 So if you know Jose Garces restaurants at all, you know he’s all about the small plates. This one is his mexican variety. We just got a crapload of stuff. Let’s begin. 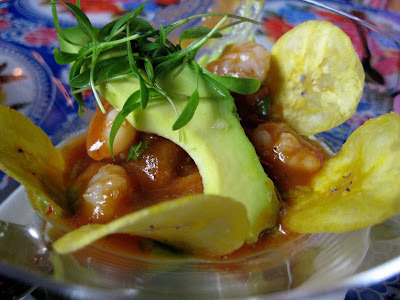 Ceviches – camarones and hamachi. The shrimp one was good, so was the yellowtail one. 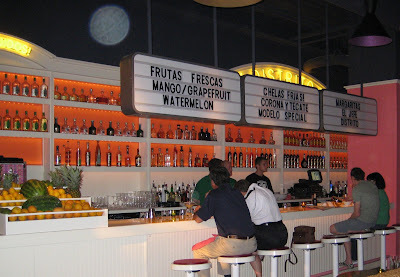 However, the sangrita sorbet on the hamachi ceviche? Weird. It was spicy, it kinda creeped me out. I did not enjoy that sorbet. 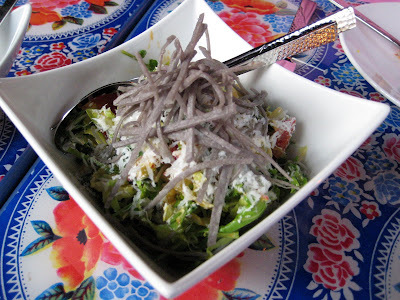 Onto the ensalada: chilango chop. I think. Simple, yet good. Los Tacos! My favorite part. From the top: camarones y chorizo, carne kobe, and pollo. Ok, I didn’t taste the shrimp and chorizo ones, but W and Moms weren’t too crazy about them. They liked em, but not as much as the others. The carne kobe, oh my word, freakin kobe steak, with truffles, mash, and little french fries, topped withi cilantro greens. Seriously folks, one of the best things I’ve eaten all year. I could eat these all day long. But you know what? I could totally eat the chicken ones every day too. The chicken tacos were also so amazing! 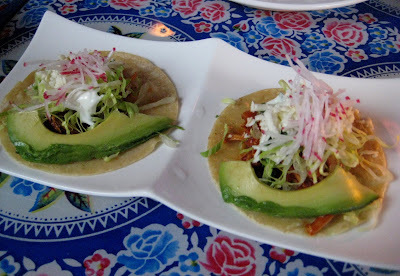 Super flavorful chicken ropa vieja, with queso fresco, radish, and a big hunk of avocado. 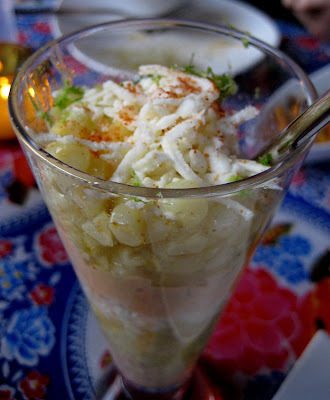 Onto the Tradicionales: Esquites. So simple, yet so good. A glass with sweet corn, queso fresco, chipotle, and lime. Hard to imagine putting these things together, but once it’s done, it was so surprisingly good. 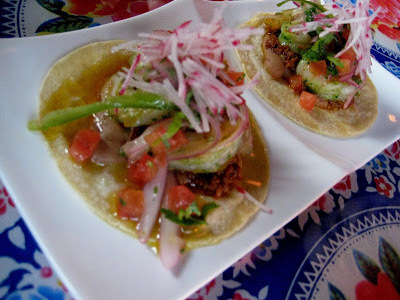 Here’s the craziest thing we ate from the Mar Y Tierra section: Tuetano! Yes folks, I tried bone marrow! It was served with bacon marmalade, chopped jalapenos, and chopped onions. 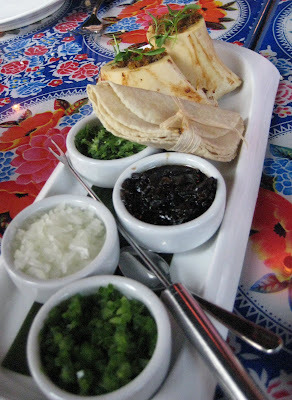 It came with tiny corn tortillas, and you scoop out the bone marrow, put on some toppings, and make yourself a little bone marrow taco. So what’s bone marrow like? Well, it’s fatty. Soft, melts-in-your-mouth, fatty. And when used as the meat for a little taco, it’s quite good. Now I’m not going to say I want to eat this all the time, but for something I’d never had before, it was great. I’m glad I tried it. 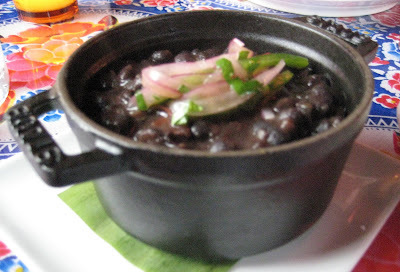 A few accompanamientos: plantains, and black beans and rice. 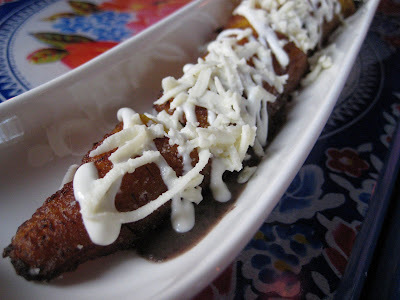 The plantain came on top of some pureed black beans and were topped with queso fresco. It was great. The beans were great too. It’s a teeny little serving, don’t think that’s a giant cast iron cauldron of beans. It was petite, but tasty. Desserts! Flan, churros, and the cha cha cha. The flan is served with chantilly cream and coconut tuille. I didn’t taste this, but W loved it. The churros were lovely! The coffee ice cream that came with it was awesome. Some of the best coffee ice cream I’ve ever had. 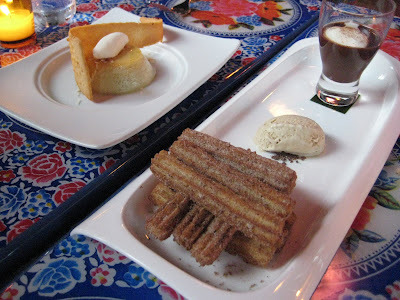 And the mexican hot chocolate to dip the churros in was strong, thick, and perfect. 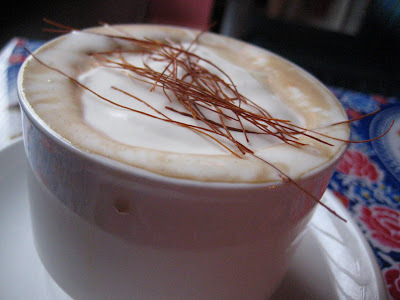 This cha cha cha was coffee, kahlua, and cinnamon. The service here was great. Since you’re sharing and trying tons of stuff, they come and give you clean plates and utencils several times during the meal. It’s a pretty well oiled machine. Everyone was nice and helpful. The food comes out as it’s prepared, not in courses. So you’re just constantly eating all the time, which is nice. We all loved everything we ate. We were all quite happy, full, and satisfied. And in the end, it really didn’t end up being that expensive. If you take out the fact that the bro drank two strong and expensive margaritas and that desserts isn’t something I typically do, it was quite reasonable, and only about $25 per person. That’s not expensive at all for the quality of food and service that you’re getting. 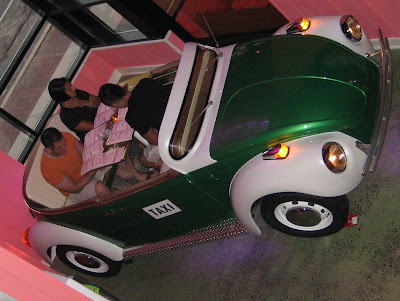 They do have this VW bug booth. I want to eat there some day. I’m a fan of Jose Garces. I can’t wait to see what else he comes up with. 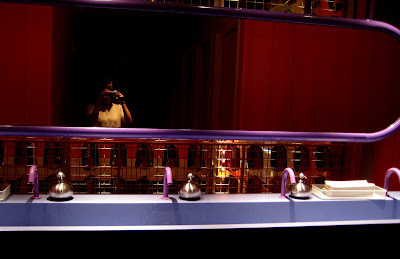 PS – They have tons of individual bathroom stalls, with a shared trough style sink. Not sure how I feel about it, but that’s just as gawdy as their other stuff.